I’ve had a lot of encouraging feedback these past few weeks from friends who are excited about my pending CD release. Some folks have already purchased their copy and some have even given me money gifts to support the recording costs. That’s wonderful! However, most of you might not have the cash to do that and aside from buying your own copy you might think that there’s not much you can do to help. Actually, there is a lot of ways for everyone who enjoys my songs to get word out and help create some viral marketing. Yeah! I took the plunge and signed up for Twitter this week. I am still learning how to use it effectively. It’s a simple concept, but I would love any advice from Twitter users about how to integrate it with Facebook, wordpress, and myspace. Me anwhile, I’m starting to feel overwhelmed with social networking fatigue. 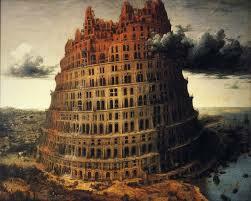 This morning, I was thinking about social networking in light of the story of the “Tower of Babel.” It’s as if we are building this amazing system of communication that has the potential of connecting everyone on the planet. But, it seems like the bigger it gets the more confusing it is and the more we actually fail to communicate. Lately, email is not successfully communicating. Facebook is also loosing it’s effectiveness. Blogs seem to be neglected by their authors. I feel like the more I reach for the masses, the more I seem to loose the effectiveness of my message. A more traditional, geographic system of community reaches fewer people, but each interaction is more meaningful. Sarah and I have been enjoying the opportunities to show hospitality that owning a home provides. Having face-to-face interactions gives me so much more satisfaction as well as genuine concern for my neighbor. So with that being said, I want to encourage everyone who reads this to have a very Happy Halloween! Turn off your computer and knock on your neighbor’s door and do some good old-fashioned social networking. Are blogs/facebook/twitter relevant to the poor? I want to toss out a question that I’m wrestling with. I don’t have an answer, so I need some help. Of course my first thought is that social networking websites are only for people above the poverty line. These websites are free services, but it’s only useful if the users have a computer in their home and can afford to maintain a high speed internet connection. I have interacted with folks who don’t have these luxuries. They have an email address, but they have to go to the library to get online. A phone call, “snail-mail”, or a face-to-face meeting is the best way to communicate with them. However, it’s becoming much cheaper to own a computer. Maybe in the near future, people will save up to buy a computer before they buy a TV or even a car. Also, free WiFi is become more and more available with even some cities trying to make their entire downtown into a “hot spot”. There’s also the growing availability of internet on cell phones. My brother in law, Eric, has covered this topic extensively on his blog, White African. Apparently, in the poorest parts of the world you can find people logging on to the internet with cell phones. The reason that I’m asking this question is that the way we do church is evolving according to what the media is telling us. They are telling us that social networking is the wave of the future. I have already done a lot to embrace this change. Obviously, this blog is part of that. One reason the I created this blog was that I wanted to create a forum for people in our church to discuss ideas, share experiences, and to process our worship together as a community. But, my concern is that if I want to talk about worship in the city and the poor are excluded from participating in the discussion, then am I a really big fat hypocrite?